False-color pictures of the planet Mercury - shrunk down from the image at this NASA.gov blog post. 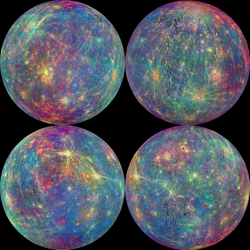 There are plenty of other things to pick on about astrology, but, here, I'm going to focus on some Mercury-related things. Though this is more about history than about modern-day astrology - since fortunately, there probably aren't many modern astrologers nowadays who would go around making absurd claims about the supposed benefits of the element mercury. But unfortunately, there are plenty of modern-day non-astrologers (and perhaps some astrologers too) who make absurd claims about mercury's supposed safety and fitness for use in things such as light bulbs, dental fillings, and vaccines. The real, physical, scientific, Periodic Table of Elements element of mercury has many horrible effects on health. Which is interesting from an astrological perspective, since the planet Mercury in astrology is associated with intelligence, communication, and so on, and usually isn't considered bad. In fact, one of the symbols associated with mythological Mercury is the caduceus - which, to this day, is a traditional symbol of medicine. But, meanwhile, the actual physical element of mercury can give you brain damage and numerous other terrible health problems. That's even worse than astrological Mercury retrograde! I wonder if the ludicrous notion that mercury in dentistry is harmless was somehow inspired or fueled by astrology? Judging by Wikipedia, mercury fillings in dentistry have a long history. The Mercury (element) article on Wikipedia mentions (among other interesting things) that the first emperor of China, Q�n Shǐ Hu�ng D� (260�210 BC), "was killed by drinking a mercury and powdered jade mixture formulated by Qin alchemists (causing liver failure, mercury poisoning, and brain death) who intended to give him eternal life." I wonder what was more to blame for superstitious overly positive beliefs about mercury - alchemy or astrology? Don't know, and I don't feel like researching in depth right now. But, thank God for skepticism and real science. Such a pity that even in our modern, more logical and skeptical era, there's still the persistent use of mercury-containing amalgam dental fillings, despite the info on this page from EPA.gov. And, there's still widespread acceptance of the use of mercury in fluorescent light bulbs - even despite the alarmingly elaborate waste cleanup measures recommended if you break such a light bulb. "Mercury release rates are low, new data show, but can build to toxic levels if broken bulbs aren't cleaned up right away." And, the idea that mercury in vaccines causes autism is surprisingly often viciously criticized. Here's Wikipedia's Thiomersal controversy article. But, regardless of whether or not there really is a direct link between mercury in vaccines and autism - I can't imagine that mercury in vaccines does no harm at all, given the fact that mercury is scientifically known to be a very toxic, potentially lethal substance. Even if the mercury in vaccines isn't causing autism, my guess is the mercury is probably at least causing other bad effects of some kind(s). Why wouldn't it? Skeptics often say extraordinary claims require extraordinary evidence. So, doesn't the claim that such an extremely toxic substance as mercury is somehow safe to use in vaccines, dental fillings, and light bulbs qualify as an extraordinary claim which requires extraordinary evidence? And, returning to the topic of astrology - wouldn't it be awful if the belief that mercury is safe or even beneficial to use in dental fillings, etc. actually historically traces back to astrology? If that's the case, maybe astrology has done even more harm to the world than I thought. Even if astrology only reinforced (rather than originated) the pseudoscientific idea that "the element mercury is safe or even beneficial for human health", that would be bad. I wish some historian(s) would look into that. But more importantly, I wish mercury wasn't still in such common use in places it shouldn't be, in my opinion. We should know better by now, and learn from the past mistakes of alchemy and astrology. Comments are welcome on the Eryss.Com Forum, either here or elsewhere - but, it's moderated, and I tend to be rather lazy about checking for new posts, so, please don't expect a fast-paced brawl.